I have just been looking around for ideas for sewing dog toys, and I’ve found so many good ideas that I am going to make a list here of the articles, with my comments. A couple of them are on how to make dog toys without any sewing. My results? Well, less than stellar so far! See the end of this article. What about adding squeakers inside your creations? You can buy them online… here is a link to a search on Amazon for dog toy squeakers. I linked to the search rather than to particular ones because they come in a variety of sizes. I ordered myself these popular squeakers in medium. Here is a page on a simple project, sewing a dog toy bone. It doesn’t take much fabric and you can size it large or small. On the same site, here are some photos of toy bones and other dog toys that people made. Here is another quick and easy dog toy. You sew a strip of fabric, and in the example you can see it has a patchworky look but you could just start with one long strip and end up with something just as much fun if a tad less cute. Once you have the strip, you fill it with bunches of fabric scraps and knot it in between. Very minimal sewing here; see the page for illustrations. This Pinterest page about sewing projects with fleece includes both dog and non-dog ideas. I followed the link on one that is called a hopefully indestructible stuffed dog toy. This is on my short list of things I may do, as our Rottie loves to chew! I had old jeans in mind when I started thinking about making some dog toys, as I have a lot of denim scraps. 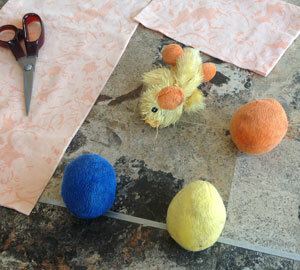 Here’s an article from ehow on how to sew dog toys from old jeans. The only thing I wouldn’t do is go out and buy any polyfill, but I could find all sorts of soft rags around the house to use for fill. I didn’t notice any sewing on this page: 10 DIY dog toys you can make for pennies.Personally, I stopped using tennis balls with my dogs a few years ago, after reading that they can be hard on dogs’ teeth. Otherwise, a lot of great ideas that you can make in practically no time. And here is a nice list of ways to make them with and without sewing. My same comment about tennis balls applies. Several of the articles I quote say how much their dogs loved their new toys. My two, not so much. First I made a couple of “bones” from an old pair of pants. I stuffed them with old t-shirt scraps. Nicky, our new rescued Sheltie-Papillon ignored his. 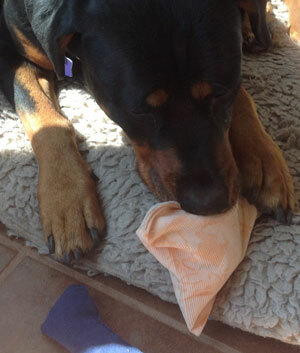 Lola, our six-year-old Rottweiler, did take hers over to her bed for a bit of chewing. Next, I took four high-value (but a bit dangerous to the Rottie) dog toys and it seems that I managed to turn them into two low-value toys! The thing was, I didn’t feel safe leaving them out because Lola would chew and chew on them. At the time of encasing them in the corduroy shown here, only two of the squeakers still worked, and we had only had them a few days. These took me about ten minutes to make. I used an old curtain valance that was hemmed, and I just cut the ends off it, put two toys in each packet, and sewed them up. Nicky sniffed it politely (see image at the top of the page) but he seems to have no interest in playing with it, even after I squeaked it. Lola is chewing some on hers, and at the bottom of the photo you can see the navy blue bone. Oh well, live and learn! I will try more another time. Lola does like them. And maybe Nicky will find them more interesting later. Nicky DID get more into them over a couple of days. And I AM going to get some of those squeaky things I mention in the second paragraph, to put into toys. They both love squeaky noises.